Commonly found in deicing products, calcium chloride is an alternative to the ubiquitous and inexpensive sodium chloride, or rock salt. Because it is more expensive and more difficult to handle than rock salt, calcium chloride is rarely if ever applied for removing the ice on roads and highways. But homeowners may choose calcium chloride for use on their sidewalks and driveways in an effort to get rid of ice while preserving their landscaping. Dead patches of lawn near sidewalks or driveways may be the result of excess calcium chloride. At proper levels, calcium chloride applied with urea stimulates grass growth. Calcium chloride can improve the soil in the root zone. Calcium added to the soil makes the grass more efficient at using nitrogen, stimulates photosynthesis and increases absorption of ammonium, potassium and phosphorus. The amount of calcium chloride required for these benefits varies. Use soil test results to determine if your grass would benefit from calcium chloride. Typically, you would apply ½ to 1 pound of calcium chloride per 1 pound of urea. Although calcium chloride is safer than salt, it is still corrosive. Excessive amounts of calcium chloride can damage the roots of grass. As the compound melts the ice off of driveways and sidewalks, it dissolves in the melted ice and often runs off onto nearby grass. 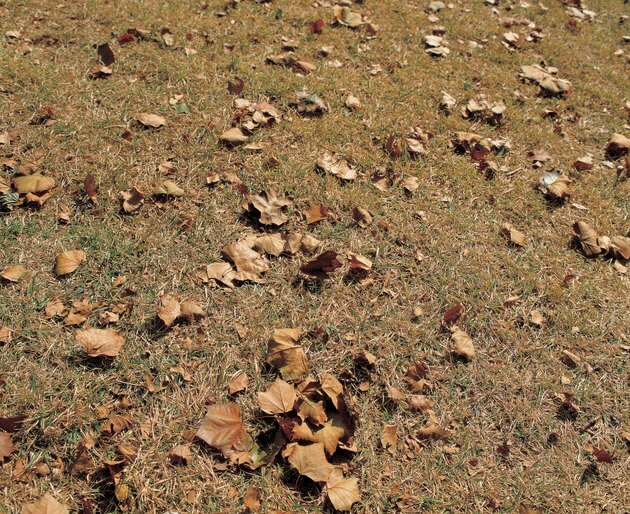 If you observe brown blades of grass, stunted grass growth or dead patches near driveways and walks, this may be the result of excess amounts of calcium chloride or other chemicals in deicing products. Ice melt products with calcium chloride tend to be more grass-friendly than rock salt, but you still want to avoid using them in excess. Consider applying sand or cinders on icy spots rather than any deicing compound. You may also find it effective to remove snow and ice by hand whenever possible and reserve ice melting products for just the tough spots. Avoid late-winter applications of calcium chloride, if possible, because that is the time when plants are coming out of dormancy and are highly susceptible to injury. Avoid urea or other fertilizers as deicing products because they can run off and pollute groundwater and surface water. If you have used calcium chloride during the past winter, make sure lawn drainage is adequate so that rainwater can leach excess calcium chloride from the soil. If you have a dry spring, water your grass by hand to flush the extra calcium chloride out of the soil. If you need to reseed your lawn in spots, add fresh topsoil or mix compost or other organic matter into the soil to a depth of 6 inches.